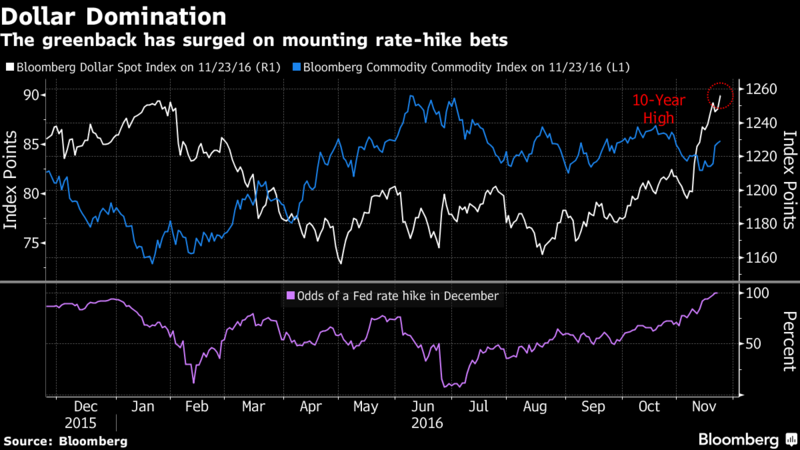 The dollar extended gains at the highest in more than a decade as a stronger case for hiking U.S. interest rates weighed on bonds and gold. Japanese stocks climbed, while emerging-market assets dropped. The greenback rose to near a more than seven-month high against the yen, with U.S. markets to be closed for Thanksgiving. Japan’s Topix index climbed for a 10th straight session as investors returned from a holiday, while South Korea’s equity index and currency lost at least 0.6 percent. The Philippine peso fell to 50 per dollar for the first time since 2008. Ten-year Australian and New Zealand government debt yields rose for a second day, as gold traded near a nine-month low. Copper and zinc surged. The bond selloff sparked by Donald Trump’s unexpected election as U.S. president has resumed, after better-than-estimated data on durable goods orders and manufacturing helped keep bets on a Federal Reserve rate hike next month at 100 percent. Central bank officials saw a stronger case for policy tightening amid solidity in the labor market, with some saying a hike should take place in December, according to minutes of the November gathering. U.S. equity benchmarks extended records last session, while the prospect of higher rates from Janet Yellen’s Fed is again weighing on emerging markets. “The dollar has been really strong in anticipation of Yellen’s move next month and that strength in the U.S. dollar is ultimately going to mean that emerging market assets would be seen as disadvantaged,” Nicholas Teo, a strategist at KGI Fraser Securities in Singapore, said by phone. The Bloomberg-JPMorgan Asia Dollar Index is trading at the weakest since 2009 — led by the Philippine peso’s plunge past 50 per dollar. The Thailand baht, Indian rupee and Indonesian rupiah each lost 0.4 percent Thursday.